I hate vacuuming. It’s not that I’m lazy and don’t want to clean, it’s that I really just hate the noise my vacuum makes. Headphones go a long way toward drowning it out, but it still just gets on my nerves. Wouldn’t it be great if instead of some ungodly noise, your sweeper blasted out music of your choice? 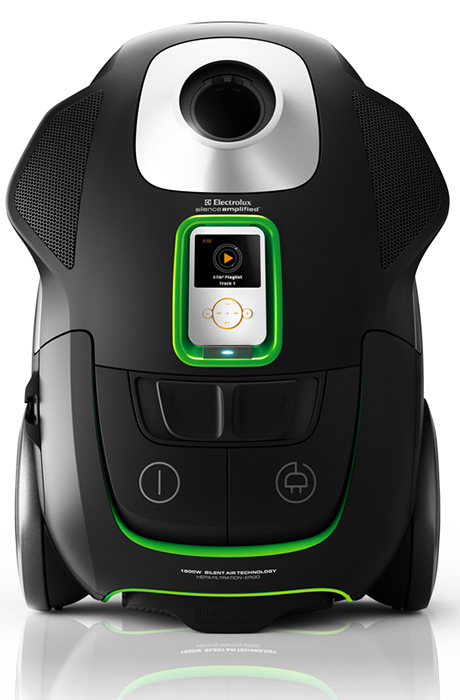 The folks at Electrolux have been hard at work on just such a device. It appears to be currently in its concept stage, but the Silence Amplified vacuum is not only one of the quietest of its kind, but features a fancy little iPod dock and some speakers. In their quest to make the perfect cleaning tool, they did a study to see how music affected people’s cleaning routines. It seems that hard rock gets the job done fastest (which explains how I can make the house spotless in record time) while those listening to jazz are more thorough (did I say spotless? Well it looks clean enough.). No word on if or when this will be turned into an actual product we’ll be able to purchase. Being the bachelor that I am, I wouldn’t exactly call myself a clean freak. Granted, I usually keep things pretty tidy, since I can’t work in a messy office, but I’d fail the old white glove test. One thing that I do hate is when people touch my monitors or TV. I spend half my day staring at one, so I really don’t want fingerprints on it. I generally use a microfiber cloth to clean my screens, but here’s another interesting solution. 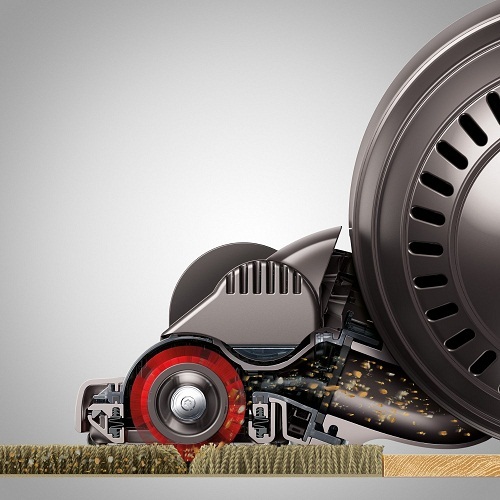 The TV Clean is sort of like a lint roller for your LCD monitor or TV. 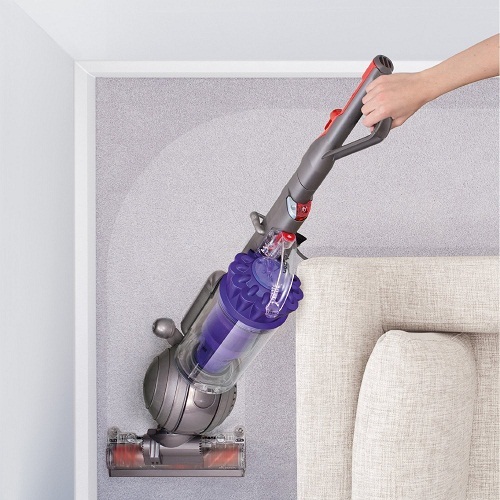 You just roll the little device over your screen, and its rubber roller picks up any dust and dirt, which is transferred to a sticky roller. 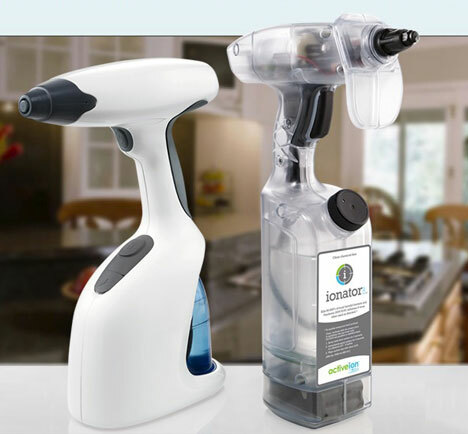 This does seem like an easy way to get the dust off, but unfortunately you’ll still need to use a microfiber cloth to remove fingerprints and such. $50 seems a bit expensive for a dust remover. I’m sure it works just fine, but so does my method, and I don’t have to pay for refills. Here’s a story I’ll share even though it will make me seem a tad stupid. I wear glasses(I gave up contacts long ago because of the daily hassle) and always had trouble keeping them clean. The sprays and special cloths didn’t work as much as I’d like, so one day I thought of a brilliant idea to keep the glasses really clean. I used Gojo, the orange pumice soap to remove some tough paint stains from the glasses. The glasses came clean and I began using Gojo regularly. That is until I had scratched the glasses so much that I finally noticed it and realized how dumb I had been. So this little machine might be the thing for me since it means my newest pair of glasses won’t be touched by anything. 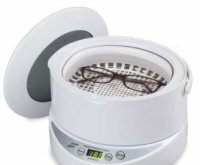 The Ultrasonic Eyeglass cleaner cleans glasses(and jewelry, CDs and many other items) by emitting sound waves at 42,000 Hz. The sound waves knock off all the dust and dirt leaving your glasses nice and clean and scratch free. There are multiple time settings and three power levels. And the cleaning box is large enough to hold two pairs of glasses. You can order this online for $69.95 (Embarassing story not included).